The Sacred Page: The Next Secretary of State? A number of sources are reporting that Pope Benedict is about to name the next Secretary of State. The Vatican's Secretary of State effectively functions as the Pope's Prime Minister and is responsible for directing the Curia. In other words, this office ranks among the two most influential positions in the Church under the Pope--the other, of course, being the Prefect of the Congregation for the Doctrine of the Faith. Because of their high profile, those who hold the position of Secretary of State are inevitably seen as "front runners" in later papal conclaves. In fact, only one Cardinal Secretary of State has ever been elected pope: Eugenio Pacelli (Pius XII), served at that post from 1930-1939. Another former holder of the office, Luigi Lambruschini, apparently came very close to being elected after Gregory XVI died in 1846--the conclave went on to select Pius IX. The present Secretary of State, Cardinal Angelo Sodano, has held the office for fifteen years--which is the longest term since Pietro Cardinal Gasparri, who served in that position for sixteen years (1914-1930). At the age of 78, Sodano is well past retirement age. 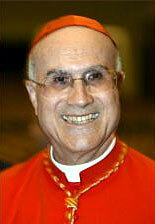 According to numerous sources, Benedict has already decided who will replace Sodano: Cardinal Tarcisio Bertone. Here's a little background on Bertone. Cardinal Bertone, who is 71, is a Selesian (the Order of Don Bosco). He made his religious profession on December 3, 1950 and was ordained on July 1, 1960. Bertone earned his licentiate in theology and his doctorate in canon law from the Ponifical Salesian Athanaeum. His dissertations dealt with religious freedom and 18th century church government and Pope Benedict XIV. Among other things, he served for a long time as professor of canon law and was intimately involved with the writing of the new Code of Canon Law. In June of 1991, Pope John Paul II made Bertone Archbishop of Vercelli. However, Bertone resigned from that position four short years later after the Pope appointed him Secretary of the Congregation for the Doctrine of the Faith. There Bertone served as the present pope's right hand man. He is the co-signer of some of the most significant documents published under Ratzinger (e.g., the document on the ordination of women). He was appointed Archbishop of Genoa in 2002 and was created a Cardinal by John Paul II the following year. John Paul had such confidence in Bertone that he entrusted to him the task of publishing the third secret of Fatima. It was said that he spent hours with Sister Lucia. Interestingly, it was also Bertone who, as Secretary of the CDF, reiterated the Vatican's official position on Medjugorje: "...official pilgrimages to Medjugorje, understood as a place of authentic Marian apparitions, are not permitted to be organized either on the parish or on the diocesan level..."
Bertone has written a number of articles, which are available on-line. In 2004, Bertone made headlines when he established a commision to deal with possible cases of demonic possession in his diocese. The commission included three priests and three doctors--a neurologist, a psychiatrist, and a psychologist. Bertone insisted, "Possession is not a fiction." "Anti-Catholicism is the last acceptable prejudice," [Bertone] said. "I ask myself if a similar book was written. full of lies about Budda, Muhammed or . . . if a novel came out which manipulated all the history of the Holocaust or of the Shoah, what would have happenend?" One last thing... Bertone is a huge soccer fan. In Italy he is known for occassionally appearing on the radio, doing the play-by-play for his favorite team, Juventus. He also makes appearances on the popular radio program, Not Only Sports, on Rome's 105 FM. In one of his more controversial interviews Bertone argreed with the concern that too many foreign players are playing on Italian soccer teams: "It's true we're in a world of globalization, but we don't need to go and draw from foreign teams," Bertone agreed. "We need to help our young players. Great champions have been born on our fields." Cardinal Bertone doesn't pull punches.